I found this interesting creation last night at Central Station, Sydney. The forecourt/carpark area is currently being renovated. And traffic is redirected around road that is being worked on. 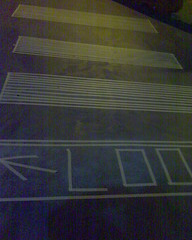 To accommodate pedestrian traffic weaving though the debris, a temporary pedestrian crossing has been constructed with masking tape. And while it may seem a little silly, it worked quite well. Easy to see and weathered being run over without lifting up. I just love hand-made and unofficial pedestrian crossings. Please find some more.